Thomas Tuchel described Carlo Ancelotti as an inspiration ahead of their Champions League meeting as Paris Saint-Germain host Napoli on Wednesday. Ancelotti helped PSG to the Ligue 1 title in 2013, the French club's first league championship since 1994, before leaving to take over at Real Madrid. He returned to the Parc des Princes with Bayern Munich last season but suffered a 3-0 defeat that brought about the end of his tenure at the Bundesliga giants. Now back in his native Italy with Napoli, Ancelotti will hope for better fortunes with the Partenopei in the first of two successive Group C meetings with PSG, whose current boss was full of praise for his counterpart. "At first I admired him as a player, I saw him on TV, he was in a big club and you could feel even through the TV that he was special," Tuchel told a media conference ahead of the meeting in south-west Paris. "Then as a coach at AC Milan, his game was fluid. Watching Carlo Ancelotti's teams was an inspiration to me." PSG will likely be without captain Thiago Silva because of a hamstring injury while Marco Verratti and Angel Di Maria are each expected to be fit despite muscle strains. "Thiago Silva did not train this morning [Tuesday], we have another one [session] tomorrow but it will be a test," Tuchel added. "[Verratti] trained today and that's important because he had a muscular discomfort against Amiens. He trained without problems. It's a special match for him because I think and I see that he loves Ancelotti." PSG have only reached the semi-finals of the Champions League once in their history, back in 1995, and their last six seasons in the competition have seen them string together four quarter-final exits before going out in the round of 16 in the last two campaigns. Napoli are top of the group on four points after beating Liverpool 1-0 last time out, with PSG level with the Premier League club on three points. 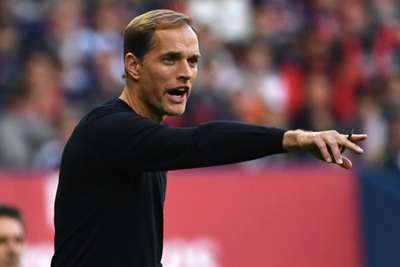 Asked if the attacking quartet of Neymar, Kylian Mbappe, Edinson Cavani and Di Maria are the key to their hopes of finally succeeding in Europe, Tuchel said: "In this competition, the effort must come from everyone. "We have an amazing team and players too. We are in a big club, a big city but we do not have a big experience in the Champions League. We are not used to reaching the last four and that's why it's so hard to improve in the Champions League. "The four players are very important to us but we have to play as a team."